As one of the pioneers of tourism on the Bonavista Peninsula and one of the longest continuous running tourism operators in the region, journalists and media influencers have often turned to Tineke and Marieke Gow of the Artisan Inn as a source of in-depth information of the history of our area, the experiences on offer and perspectives and opinions regarding the area’s journey from a fishing / boat building village to one of Newfoundland’s strongest tourism draws. Our unique product and history have contributed to stories featured in publications such as the New York Times, National Geographic and Enroute Magazine. The image of the Artisan Inn’s colourful buildings lining the shore of Trinity has become one of the most iconic photos of Rural Newfoundland to circulate the world. If we cannot provide the information or angle required for your piece, we often know who can, and will assist as a liaison between the two when possible. Marieke is heavily involved in various tourism focused organizations. She is the past chair of Legendary Coasts of Eastern Newfoundland which focuses on destination development of the Eastern Region of Newfoundland and served on the Provincial Tourism board for 4 years, a body responsible for the implementation of the provincial tourism strategy Uncommon Potential. She has often been asked to represent the tourism sector for media outlets focusing stories on destination development, rural tourism, tourism trends and millennials in tourism. In recent years, she has participated in interviews with Rogers, Eastlink, VOCM and CBC to discuss the state of tourism. Her heavy involvement in the tourism industry means that if she cannot provide the answers or perspective a media outlet is looking for, she can put you in contact with someone who can. 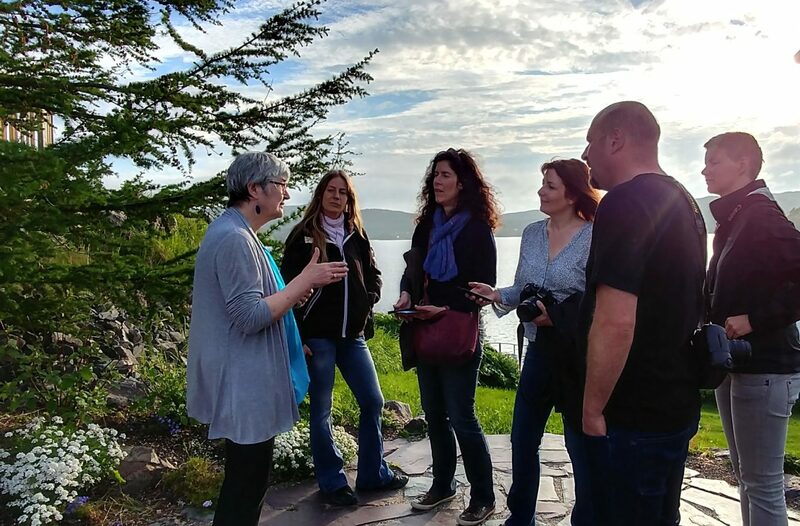 We most often host journalists who are working with our Destination Management Organization Legendary Coasts of Eastern Newfoundland and our Provincial Tourism Department. In these cases, the DMO covers most of or all travel, accommodation, activities and meal costs for media. If you are a media influencer or journalist interested in doing a story on our area or about our business, we encourage you to contact Andrew Hiscock to see if you qualify for assistance from the media program. From time to time the Artisan Inn and Twine Loft will receive requests for free accommodations or services in exchange for media coverage. While we primarily focus on working with media who can cover their costs directly or with the provincial media program, if you are a professional travel writer or travel influencer that has not qualified for the Legendary Coasts media program and feels that their work will be beneficial to our area, please contact Marieke Gow, the inn’s manager, via mgow@trinityvacations.com with an introduction and the information requested below. What form of media do you focus on? Where will the work you produce from your experience with us appear? Do you work with particular publications? Will this appear on your own website or blog? If you are a freelancer, what publications are you planning to pitch your work to? Is there a particular theme to the work you produce and share? Who is your key audience and why do you feel they would consider taking a trip to our destination or style of establishment? Please provide a sample of previous work and explain where it appeared and what type of reach and interaction it received. Once we have discussed what you wish to do, a short custom contract will be drawn up outlining the expectations of both parties. The inn will require credit card information to hold the room. Should the outlined content not be delivered by the date agreed upon by both parties in the contract, the provided credit card may be charged for the full amount of services if a satisfactory follow up to the original contract is not provided by the media person. Please note that cancelling the visit within 2 weeks of the booked stay will count as not delivering on the contracted services and the accommodations will be charged to the provided credit card unless the room is rebooked.